2 Pull hard the yellow strap located in the central armrest. If the hand brakes are stuck: Open the lid on the armrest between the seats and remove the rubber mat. Pull the yellow strap. If this does not work, try to disconnect the battery and pull the yellow strap again. 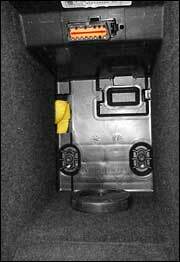 If the hand brakes still are stuck, you must get under the car and try to knock them loose; if necessary replace the cables.